Last week, we learned that Patrick Sharp had been traded away to the Dallas Stars along with top d-prospect Stephen Johns. 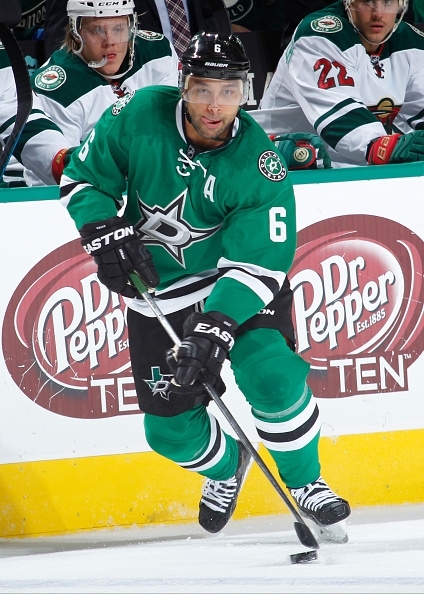 In return, the Hawks received one of the Stars’ top defensemen in Trevor Daley, as well as winger Ryan Garbutt. Today, Johnny Oduya announced that he would not be returning to Chicago and will sign elsewhere sometime soon. Meanwhile, we are still waiting for more inevitable moves to be made. All things considered, however, it’s a safe bet to assume that most of the transactions that Stan Bowman will make this summer have already been completed. Let’s first start by talking a bit about the loss of Patrick Sharp. We all knew he wasn’t going to be back next season, but that didn’t ease the pain of losing him. He was one of just a few guys to have played on the Hawks during the so called “dark ages,” as well as on the three Cup-winning teams. He saw it all in Chicago and witnessed one of the biggest turnarounds a sports franchise can have. Sharp was an obvious fan favorite here for his play on the ice, as well as for his personality off the ice. He is one of the classiest players in the game. 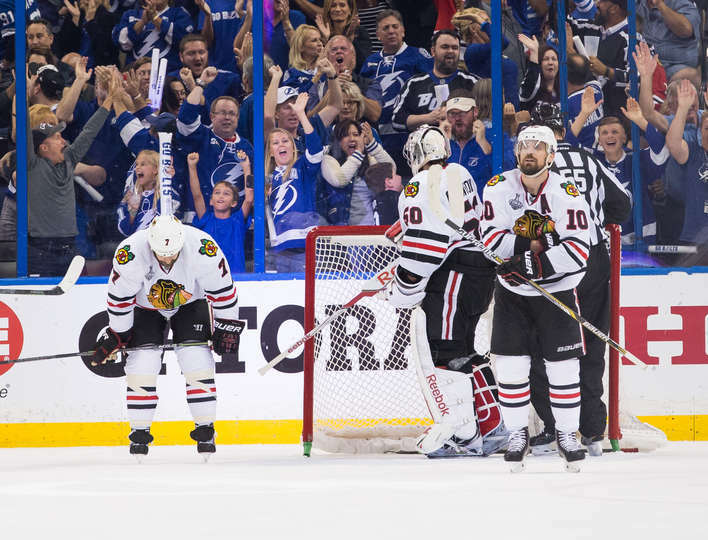 As for what he meant to the Blackhawks, he was a 30-goal scorer just two seasons ago and one of the team’s most clutch playoff performers over the last seven seasons. He could play in all situations and was one of the top leaders in the dressing room, thus leading to his title as Assistant Captain. Moving Sharp’s $5.9 million dollar cap hit was absolutely necessary for the Blackhawks, but that doesn’t make this any easier. It will be tough watching him play against the Hawks in the coming years, but so it goes. He’ll forever be a fixture in the history of this franchise. In return for Sharp, the Hawks got Trevor Daley and Ryan Garbutt. Daley figures to be a part of the team’s top four defensemen next season now that we know Oduya is gone. For those unaware, Daley is a step above Oduya in terms of his offense (16 goals last season), but he’s a step or two below Oduya defensively. Whereas Johnny Oduya saw heavy minutes on the Hawks’ penalty kill, Trevor Daley will most likely not. That’s not to say he can’t learn a thing or two from the Hawks’ coaching staff, but it’s a safe guess. He will, however, more than likely see lots of powerplay time. Ryan Garbutt, when in the lineup, which may or may not be every night, will almost certainly see all of his time spent on the bottom two lines of the Blackhawks. He’s a gritty player somewhat like Desjardins and Shaw, although with less skill than Shaw. It’s possible that he will be battling it out with other players for a consistent role in the lineup. A couple of things to mention here. First of all, Kruger has yet to re-sign with the Hawks. The odds of that happening increase by a ton if Bowman can figure out a way to trade Versteeg and/or Bickell to free up more cap space. Trading either one of those guys on their own may be next to impossible to accomplish, so another player off the current roster may have to be included just to move one of those guys. Needless to say, a lot could still possibly change regarding the Hawks’ forwards. Defensively, I don’t see TVR and Rundblad being the fifth and sixth defensemen to start the season. I’ve got to believe that, again, Bowman is working to move someone and their contract to free up enough space to not only re-sign Kruger, but maybe sign a depth defensemen as well. Some names have floated around as being targets of the Hawks, but I won’t even mention those because a lot would have to happen before Bowman even begins negotiating a contract with one of them. As for the lines themselves, I would think that Joel Qunneville would like to at least start the season by having Dano and Anisimov together on the same line as they are already familiar with each other from their time in Columbus. Placing them with Patrick Kane seems to make sense at the moment, but that would force Dano into moving over to the left wing where is hasn’t played much. This means we could see him end up skating on the right side of the Hawks’ third line. If Dano does in fact begin on the third line, we’ll most likely see Artemi Panarin playing left wing alongside Anisimov and Kane. Panarin has an incredible skill set, which should blend nicely with Kane. He also speaks Russian, as does Anisimov. Whether that plays a factor into things, who knows… Of course, this is all assuming Panarin makes the NHL roster. I’ve also got Teravainen starting as the team’s third line center. It’s no secret that the Hawks would like to see him evolve into an NHL centerman, so my best guess is that they’ll start the season with him there, or possibly even on the second line centering Kane. Marko Dano can also play center, but it’s doubtful that both he and Teravainen will be centers on this team at the same time. 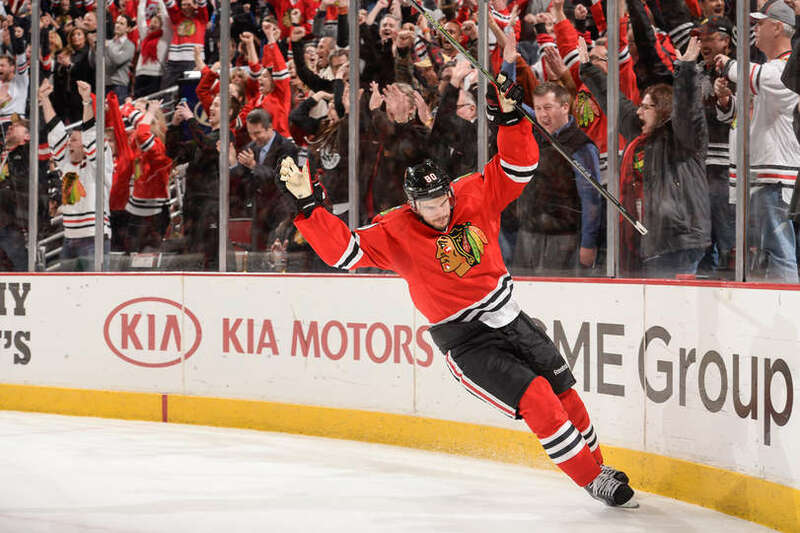 Andrew Shaw seems like the best bet to begin the season at left wing with Toews and Hossa. There’s still a lot that could potentially happen with the Hawks via trades, which makes predicting their lines a bit challenging. One thing is for sure though, and that’s that we’ll be seeing lots of new faces wearing the indian head next season. Friday night the Blackhawks earned a big two points with a shootout victory over the Edmonton Oilers in a game that turned out to be much closer than anticipated. The Oilers gave the Hawks all they could seemingly handle, but were never able to get a two-goal lead in the game. The Blackhawks ended up tying it late in the third before Antoine Vermette scored the shootout winner giving the Hawks a 2-1 victory. It’s been two games now since the trade deadline has passed, and we have gotten a good look at the Blackhawks’ acquisitions in those games. Here’s what I have noticed from them, and the team, over the last two games. Tuesday against the Hurricanes was the Blackhawks debut for both Kimmo Timonen and Antoine Vermette. Each player looked a bit lost out there at times, which was to be expected, but the Hawks as a team looked excellent. All four lines played great. You could tell the team was energized by the trades Bowman made. Friday night, in a much faster paced game than against the Hurricanes, Kimmo Timonen was noticeably struggling to keep up. I’m not too concerned with it. The guy hasn’t played in a year, and he’s almost 40 years old. Give him a few more games to get back into the swing of things before really making any judgments about him. Antoine Vermette was one of the best players on the ice against Edmonton. He had easily 2-3 great scoring chances, but couldn’t find the net on any of them. He also set up his linemates for great chances a few times, but no one converted on those either. 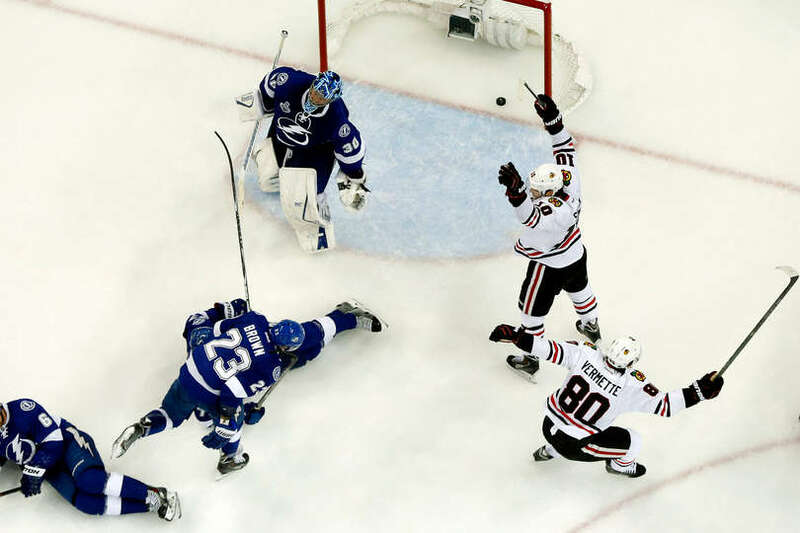 In the shootout, Vermette scored the game winning goal after misses from both Toews and Sharp. That had to be a huge moment for him. These are positive indications, and ones that hopefully continue. Corey Crawford has bounced back very well after being pulled against the Bruins a couple weeks back. He made a career high 46 saves against the Oilers on a career high 47 shots against. Pretty impressive. All four lines of the Blackhawks looked really good against Carolina on Tuesday. Against the Oilers, however, the Hawks didn’t get as much production from top to bottom. Andrew Shaw definitely makes the fourth line better now that he’s on the wing there, but I think Teravainen needs to be playing every night to really give the Hawks an advantage depth-wise over most other teams. He was scratched against the Oilers, and his vacancy on the ice was noticeable. Speaking of Teravainen, it looks like he’ll be playing tomorrow night against the Rangers on the second line, as well as on the second powerplay unit. In practice today, Patrick Sharp was skating with Richards and Carcillo on the third line. I have two problems with this. First of all, Carcillo looks like he might be playing tomorrow night in place of Bryan Bickell. Bickell has been underperforming, but I don’t think he should sit so that Carcillo can play. Car Bomb is not good. Secondly, I would move Sharp to the top line with Toews and Hossa to try and get him going offensively. He always seems to do well with 19 and 81, and the Hawks could really afford for his production to pick up. With the win over Edmonton, the Hawks now find themselves just 2 points behind the Blues, who have a game in hand, and 6 points behind the Predators, who have lost 5 straight. The Hawks have a game in hand on Nashville. The Blackhawks also have Minnesota breathing down their neck now. The Wild have won 5 straight games and sit just 4 points behind the Hawks. With about a month left to the regular season, a lot can still happen. Nashville’s once comfortable lead in the division is now not so comfortable, and the Hawks are now not that far off from being in a Wild Car position. Every game from here on out is a big one because you can expect the other top teams in the Central to win almost every night. The Blackhawks need to ramp up their level of intensity starting Sunday against New York if they want to keep pace with the rest of their division. Earlier this evening, the Blackhawks announced that they had sent top prospect Teuvo Teravainen back to the Rockford Icehogs of the AHL. In return, they called up 2013 number one draft pick, Ryan Hartman (right winger), and 28 year old defenseman Kyle Cumiskey. Cumiskey has been seeing playing time in the NHL on and off since the 2007-08 season, while also playing a number of games in the AHL. He played 4 preseason games with the Hawks this year before getting sent to Rockford for the start of the season. Well, with the return of Kris Versteeg to the Hawks’ lineup, someone had to leave it. Nordstrom was sent down to make room on the roster for Versteeg, and now Teravainen has been sent down to make room for Versteeg in the everyday lineup. While most of us would love to see Carcillo be the one to lose his spot in the lineup, that’s not happening. At least not right now. It is believed that the Hawks ultimately want Teravainen as part of their top nine forwards. With Versteeg now back in the top nine, that leaves no room for Teuvo, unless Quenneville got smart and decided to leave him as the third line center and demote Shaw to a fourth line wing where he belongs. But that’s not going to happen. Shaw is Q’s third line center, and that’s that. Instead of keeping Teravainen in the NHL and having him scratched from the lineup on a regular basis, the Hawks have opted to send him to Rockford where he’ll see loads of playing time. 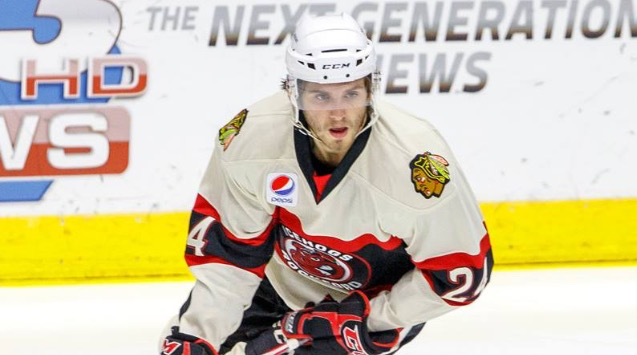 In Teravainen’s place on the roster we’ll now see West Dundee native Ryan Hartman. Hartman is looked at as being a potentially more valuable version of Andrew Shaw. They are similar players in that they are agitators who also possess offensive talent. Hartman is likely a better offensive player than Shaw, and has notched 8 goals and 10 assists in 47 games this year in Rockford. He also earned 81 penalty minutes there this year. These moves raise a few questions regarding the current state of the Blackhawks. Will they stick with 8 active defensemen on the NHL roster? What does this mean for Andrew Shaw? And to combine the two questions, is a trade looming? It’s no secret that the Blackhawks probably would like to upgrade their d-corps between now and the end of the trade deadline. I’m not sure that anyone in Chicago feels too comfortable having to rely Rozsival, Rundblad, and Oduya in the lineup at the same time on a nightly basis in the playoffs. It would be great if they could get a trustworthy, number 4-5 defensemen to replace either Rozsival or Rundblad, ideally. The odds of that happening are not great though, as almost every contender is looking to do the same thing for a low price. Still, I don’t see them progressing with eight active defensemen. Does this mean that Tim Erixon gets placed on long term injured reserve assuming no trade is made? We shall see. And let’s not forget that Trevor van Riemsdyk is due back from injury sometime before the playoffs. That adds another d-man to the roster. We would all like to believe that TVR is the answer for the Hawks’ defense, but there’s no telling what kind of shape his legs will be in or how long it will take him to get back into game-shape, let alone playoff-shape. Needless to say, more moves are to come concerning the team’s defensemen. As for Andrew Shaw, the call-up of Ryan Hartman could possibly (not likely) mean that the Hawks are looking to deal him. The Hawks need to shed some salary before next season, and with the way Shaw has performed this year, he looks expendable. Ryan Hartman, if he performs well in the NHL, is a very similar player to Shaw, and could hypothetically take his place in the lineup. If dealing Shaw results in acquiring a defensemen of the caliber that I previously described, then I’m all for it. The Blackhawks have enough offensive firepower to win without Andrew Shaw, and if Hartman can fill his void, it’s a win-win situation. Granted, this is assuming that Hartman gets a chance to prove himself, which is by no means a guarantee as long as Quenneville his behind the bench. It’s just as likely, if not more, that Carcillo continues playing every night while Hartman watches and eventually gets sent back down. 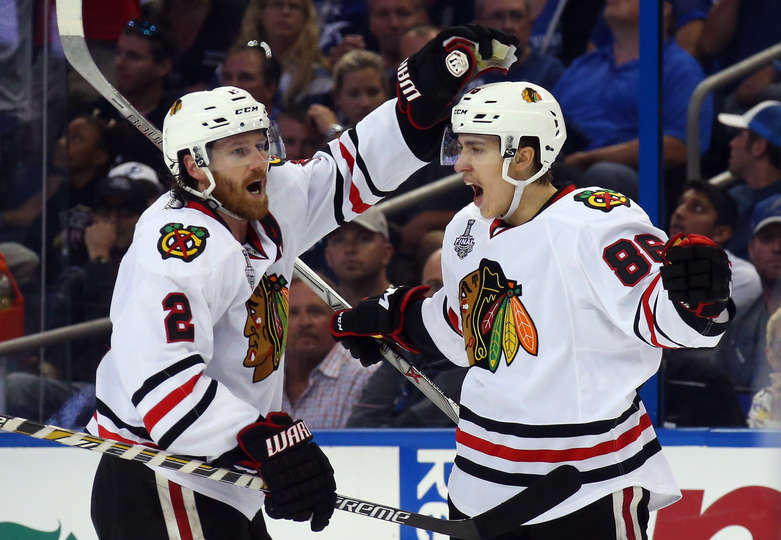 Clearly, a lot could potentially happen with the Blackhawks’ roster in the near future. One thing is for sure though, and that’s that the recent moves by the Hawks have raised a lot of eyebrows and questions. Could a trade be coming? Or do they have a different plan in store? As usual, only time will tell.